These adorable bears want to help children understand the difference God can make -- even in little lives. Each bear represents a fruit of the Spirit and, in a rhyming text that's lots of fun, tells kids ages 3 and up what God does in their hearts to make them more like Him. - Publisher Follow me to Beary Patch! My friends and I each have a great story about what God is doing in our hearts. And we want to share them with you! So come with me and I'll tell you how God gave me self-control. 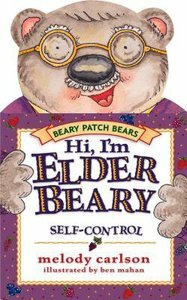 About "Hi, I'm Elderbeary (Self Control) (Beary Patch Bears Series)"
Follow me to Beary Patch! My friends and I each have a great story about what God is doing in our hearts. And we want to share them with you! So come with me and I'll tell you how God gave me self-control.